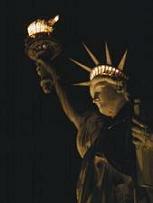 Liberty's Lamp: Did Palin Resign Because There's an Emergency? If your country was about to be destroyed and it needed the immediate attention that you couldn't give it unless you quit your job, would you quit your job? Stimulus plans to nowhere: Banks stabilizing and giving bonuses to top executives while loans dry up for people on Main Street. Banks are constricting our credit with each passing day. Bailouts: clunker car businesses sold for taxpayer cash. Unions and mismanaged divisions are bailed out while creditors get screwed and profitable dealerships get closed! Healthcare Reform: The removal of all freedoms from cradle to grave. Submit today's diet via Whitehouse.gov! Don't forget to weigh yourself on the scale that's hooked up to your electric meter. That info gets downloaded to government computers. Cap and Trade: General Electric and Al Gore get rich from making you believe you are saving the environment by paying into their pockets. Military weakness: The reduction in our defense budget and missile defense at a time when rogue nations are developing nuclear weapons, terrorists are killing our troops and our President is apologizing for our "arrogance." Federal mandates on the states: Do this or else we don't pay you! Cronyism: Obama supporters getting lucrative deals and bailouts while McCain supporters get put on DHS watch lists. Our country is being destroyed from within by the Democrat party and the radical socialist agenda being put forth by our President. American's are this close to losing their freedoms! The next time we vote, will we listen to Hannity, Rush, Palin and those who tell us about associations with radicals when the press won't? Will we even be in a position to remember how much we almost tossed 225 years of democracy out the window? I think I understand now. Yes, it's about the ethics complaints and the costs to the state and her family. Yes, it's about the kids taking unfair shots in the media. But, you know what, folks? I'm going to sound a little bit like Glenn Beck when I say this, but IT'S AN EMERGENCY! I think Sarah Palin resigned because she recognizes the emergency and her job is taking too much time away. I'm wondering if we all shouldn't quit our jobs and spend all of our time fighting to get this country back! When a woman who says "politically speaking, if I die, I die" sees an emergency so dire and in desperate need of immediate attention that she quits her job to go fix it, there's something deeply wrong here. Warriors, be prepared. This is serious. "I will take the battle nationally and I won't shy away from challenging the powerful, the entrenched, the corrupt and anyone standing in the way of getting our country back on the right track," Palin said in a written statement to the Washington Post. Then I read what I wrote in a blog back in March 2009 when I questioned whether Barack Obama was part "of an underground movement with an agenda to tear down the founding fundamentals of our country and to re-make this country in their sick twisted vision." Oh my God! Now it makes sense. The hasty resignation and the fact that many elitists and liberals didn't understand what she said makes sense now. "I resign, gotta go. I'll tell you why later, gotta go." Is there something she knows that we don't know? There is a dangerous sludge that flows deep in the bowels of both political parties, moreso the Democrats, but it's there in Washington corrupting all. That's why Sarah Palin is getting slammed by the media and the elites. She knows the sludge is there. She's coming and they know it. There are a lot of people who are going to be "oil and gas commissioned" by her when she gets there. They have to stop her and they're finding they can't.